KTM displayed the full force of their MotoGP/Moto2/Moto3 riders, teams, technology and promise in fresh 2019 colours at a presentation in Mattighofen, Austria today. Four racers in the Moto2 class and one in Moto3 illustrated the wide spectrum of potential that the factory can enjoy for the imminent Grand Prix campaign. The combination of Grand Prix winning experience and blooming talent with raw racing potential was standout in the short but comprehensive event in the heart of ‘orange country’ this afternoon. For the first time the KTM Race department drew all of their MotoGP, Moto2 and Moto3 forces together not only to unveil the Red Bull liveries for the 2019 term but to graphically illustrate the strong path through to the pinnacle of Grand Prix that begins with the Red Bull Rookie Cup and progresses through the categories to the premier class. 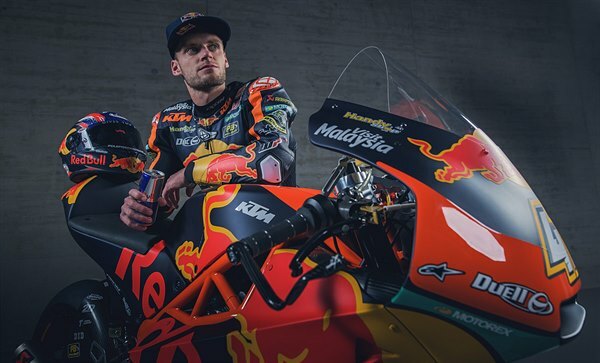 Red Bull KTM Ajo Team Manager Aki Ajo will continue to guide the progress of South Africa’s Brad Binder (24 in August); the former Moto3 World Champion earned his first spoils in Moto2 in 2018. He will also oversee the development of Moto2 rookie (and 2018 Moto3 #1) Spain’s Jorge Martin (who turned 21 in January) as the Moto2 crew discover a new engine supplier in 2019. Ajo also has the fantastic flair of Turk Can Öncü (16 in July) to steer in Moto3 for a full GP education after his startling wild-card debut at Valencia in 2018. KTM’s union with the Red Bull KTM Tech3 squad in MotoGP means that the Moto2 effort also gains more support. Tech3 welcomes two Moto3 Grand Prix victors into their operation with German Philipp Öttl (23 in May) and Italian Marco Bezzecchi (21 in November) set to make their debuts in 2019. Although youthful and still in the early trajectories of their careers KTM’s Moto2 and Moto3 riders already have a litany of spoils: 2 world championships, 23 GP triumphs and 60 podiums. The Red Bull KTM Ajo team and Red Bull KTM Tech3 will now head to the Jerez circuit in southern Spain for the first of two official tests for Moto2 and Moto3 on February 20th. This entry was posted in Global News, MotoGP, Motorsports by admin. Bookmark the permalink. ← Previous Previous post: The JCR/Honda Team grabs two more podiums and the lead in PRO / Women’s PRO points after round #2 at AMA NGPC! Next → Next post: F1 2019: Launch of the STR14!